David did a series of acoustic shows in 2001/2002 both in London and Paris. What started out as a charity event grew into a handful of solo shows that gained a lot of praise from both fans and media. 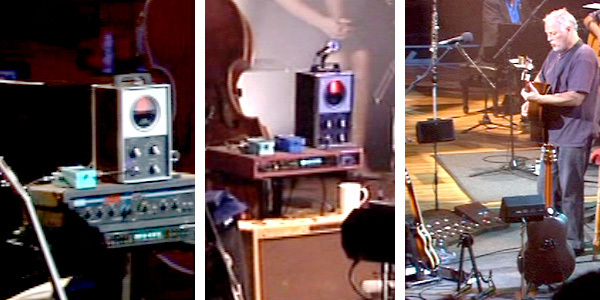 Although an unusual setting for David the rig is very similar to what heâ€™d been using on the Division Bell and later On an Island sessions. (left) 2001 setup: Conn Strobo tuner, Boss CE2 chorus, MXR Digital Delay System I and Roland SDE 3000 Digital Delay. (middle) 2002 setup: Conn Strobo tuner, Boss CE2 chorus, Boss CE2 compressor and Roland Digital Delay. (right) David at the 2001 Meltdown sho in Royal Festival Hall, London UK June 22 2001 with the 1999 Pete Cornish All Tubes pedal board. The pedal board dates from 1999 and was requested by David to be used for future guest appearances etc. The board featured Cornish custom tube preamps between each effect to ensure minimum signal loss. It could also perform in both stereo and mono. Additionally the board was designed not to allow two distortion pedals to be engaged at once, only distortion+overdrive. The Boss CS2 was replaced by a Demeter Compulator in February 2004 and a send/return for the Digitech Whammy was added in September 2004. The board was later used on the 2004 Strat Pack Fender 50th Anniversary show, in 2005 on the Live 8 Pink Floyd reunion, 2005-06 On an Island recording sessions and 2010 guest appearances. – Rosewood body with a Fishman piezo system and an internally-mounted Sony ECM-66 microphone. The piezo signal is split and routed directly to the mixing board and to the Cornish board. – Fitted with a custom Seymour Duncan soundhole pickup fed into the Cornish board (only used on the 2002 shows). Ovation Custom Legend 1619-4 acoustic steel string- With high strung unwound strings. – 1950â€™s model with Bigsby tremolo stystem. – 1x 12â€³ Jensen speaker and 2Ã—12AX7, 2xGT6V6 and 1Ã—5Y3 (rectifier) tubes. Only used on the 2001 show. – 2x 12â€³ Eminence speakers and 4Ã—12AX7, 2xGT6L6 and 2Ã—5U4 (rectifier) tubes. Only used on the 2002 shows. – stage monitor for acoustic guitars. – For â€œsound on soundâ€ effect on Shine On. (left) Martin D-28. This was only used for the 2002 shows. (middle) Taylor 712 CE. This was David's main guitar for both the 2001 and 2002 shows. (right) Ovation Custom Legend 1619-4. This had a Nashville high pitch tuning for Comfortably Numb. (left) Gretsch Duo Jet. This was the only electric apart from the slide that David used for the shows. (middle) Jose Vilaplana acoustic nylon used for High Hopes. (right) Gibson EH150 lap steel used for High Hopes and Shine On 6-9. On the intro on Shine On David is simulating keyboard pad his guitar using a very long delay. The guitar signal travels through a volume pedal (a second pedal used only for the SOS effect) and then into Roland digital delay unit with long repeats at 1500ms (20sec sustained repeats). David strums a chord, lowers the volume pedal and plays a solo fed through the â€œnormalâ€ signal path, while the Sound on Sound pad (the strummed chord) is sustained by the long delay. The pattern is repeated for each chord. 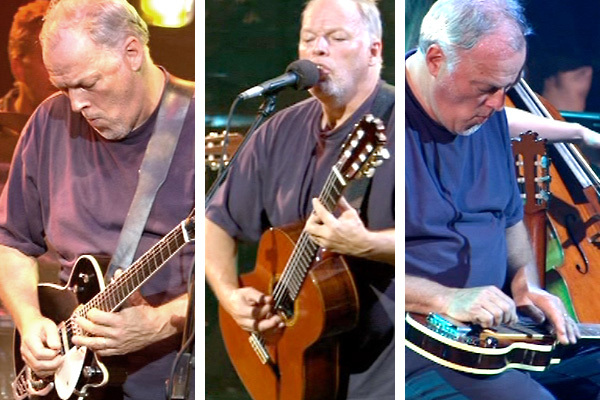 See these in-depth features for more on Davidâ€™s gear: Big Muff and Slide Guitars. 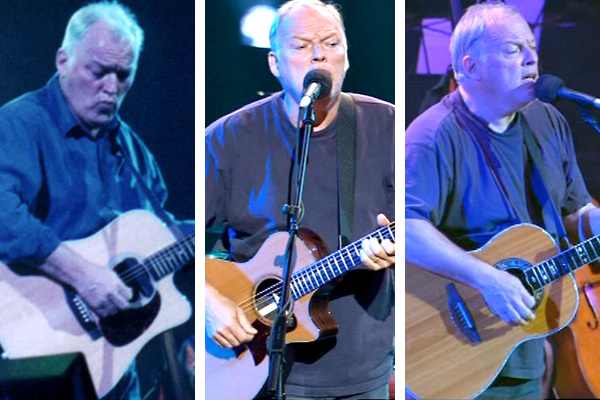 David Gilmour In Concert (concert film 2002), Guitar Player Magazine (2003), tonefromheaven.com. Thanks to Rafal Zychal and John Roscoe for help with research. See feature for other references.